The Holbrook Club boasts two high standard heated and ventilated courts. Courts are available for 40 minute booking slots from 9am – 10pm. And if you are not sure whether squash is for you, you can always take advantage of the viewing gallery to watch a few games. 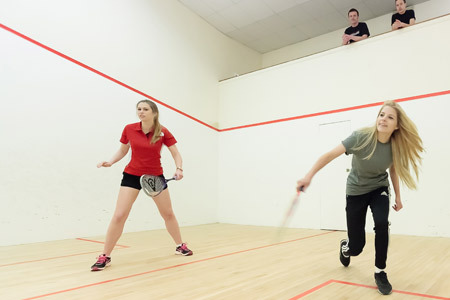 Squash Club Night is held on the first Wednesday of each month from 6.20 to 8.20 p.m. and is free to attend. Holbrook Club Members of all playing standards are welcome to come along and join in – no need to book – just turn up on the night. Meet other players, learn some new skills and try out some new shots in an informal environment. The Squash Ladder operates on a calendar monthly basis and is open to all Holbrook Club Members to join. Leagues consist of 5 or 6 players and there are currently 10 divisions with the top two players being promoted and the bottom two relegated each month.